Teaching Online AP Calculus AB this year has been an incredible experience – from creating a differentiated learning experience for each student in the class to teaching juniors and seniors to be truly resourceful and independent. One of my biggest goals in designing the class was to make the course feel connected – both student-to-student and teacher-to-student. I wanted to ensure that my students felt they were part of a class, working collaboratively to build and strengthen understanding, and strongly connected to me, their teacher. One easy solution was to include assignments each week that required teamwork. Learning online does not mean learning in isolation; in fact, some of the most powerful learning moments happen when students help and explain concepts to one another. And as a teacher, the thing I value most is getting to know my students as individuals. It’s not just about teaching them math – it’s about learning their strengths and weaknesses so that I can help them maximize success, build confidence, and most of all – enjoy the process of learning! To create a strong sense of community in the course, I chose Slack for real-time messaging and chat. What is Slack: It’s real-time messaging, archiving and search for teams (very popular right now among startups!). 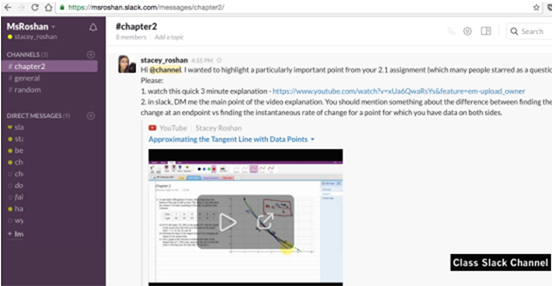 What we use Slack for: For students to problem-solve collaboratively (like they might text message a friend for homework help), ask questions and provide support to their classmates. Students can also use it to Direct Message me with questions, and I can send them private feedback. There are two synchronous components built into the course – one teacher-led full class video chat and one student-led small group video chat. The full class, one-hour discussion on Tuesday evenings is led through Zoom. What is Zoom: Zoom is a video conferencing and web conferencing service that is popular among businesses. What we use Zoom for: For our weekly synchronous sessions. We can all see and hear one another for discussion and I can also do a screen-share so that students can see me write on my screen. To engage students in the virtual Zoom session, I use Pear Deck. What we use Pear Deck for: In the weekly full class Zoom session, we start with a Pear Deck warm-up. This is an interactive presentation where students can watch me present and then participate in questions, as prompted. Students plug their Wacom tablets (a pad students can write on with a digital pen) and then are free to write out their responses to questions as they would on a piece of paper. And what’s amazing is that I see them writing in real-time, through the teacher dashboard. I love seeing the students resolve questions via chat and hearing how they’re approaching problems. I definitely enjoy ‘seeing’ my students a couple of times a week and imagine that my students probably appreciate ‘seeing’ me in the same way. Opportunities for students to verbally ‘chat things out’ and process information orally are critically important. Discussion boards and instant messaging are awesome, but there is something about hearing students talk that helps me feel more connected to them. It also helps with differentiation, as some students are stronger verbally than in writing. The other synchronous component of the course is a student-led video chat which they record and submit to me so that I can leave feedback and clarify any questions/misconceptions. This is, hands-down, one of the components of the course most important to me. Collaboration and peer-to-peer learning are the name of the game in this activity! I gain so much insight into individual and class needs by reviewing these videos—hearing students problem-solve together and chat out trouble spots with their peers. 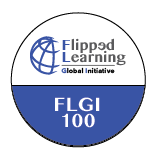 This is something I value most in my flipped classroom, and which I wanted to preserve and recreate for the online class. These small group video chats serve that purpose. Initially, I wasn’t so sure how this would go, but I have been absolutely amazed by how much good work gets done by students in these 30-minute chats. Students take full responsibility for their learning and stay accountable because they know that I am going to take the time to watch their recording and give weight to this component of their classwork. They also quickly realize that asking good questions in these sessions generates the most valuable feedback. Two-thirds of the way through this first year teaching Online AP Calculus AB, I have spent the most time and energy ensuring collaboration and creating a strong sense of class community. We are constantly chatting and interacting. Instead of asking a friend a question, students enter a question in the class Slack channel. Instead of me asking a student to come in for extra instruction, I DM that student in Slack and leave a short video response if necessary. It is amazing how much we can do online and how well we have gotten to know one another. I have a fantastic group of students to thank for such a powerful first year, filled with many lessons learned for each of us!